Get the medical and therapeutic benefits of the Professional BioMat 7000MX working for you. Whether you’re a health practitioner or a home user, you can now own your own BioMat Professional and enjoy unlimited access to the proven health benefits of the BioMat’s far infrared rays, negative ion therapy and the superconducting properties of pure amethyst. 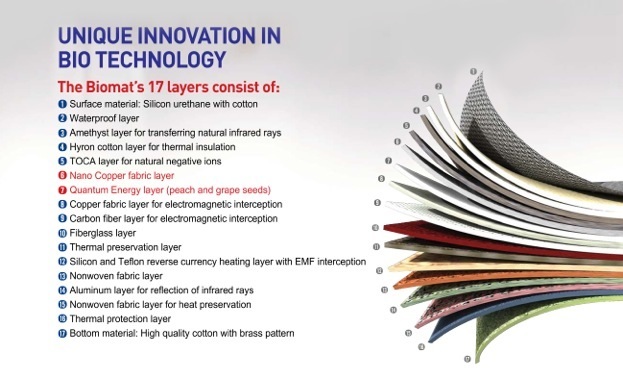 The BioMat’s unique medical and therapeutic properties are based on Nobel prize-winning research into ionic channels and the same infrared technology that NASA identified as the safest and most beneficial type of light wave. By producing deep-penetrating, far infrared rays along with negative ions that activate the body at the molecular level, the BioMat is capable of administering deep soothing experience. When you purchase a Professional BioMat 7000MX, you are investing in a medical device that uses only top-of-the-line components, including a computer control panel with, an advanced IC chip manufactured by Texas Instruments, a polarized plug for power source protection, EMF interception, tourmaline catchpower for a negative ion boost, and pure, superconducting amethyst channels covering the entire surface area. These channels are laid over a multilayer, bonded base comprising 17 unique materials. 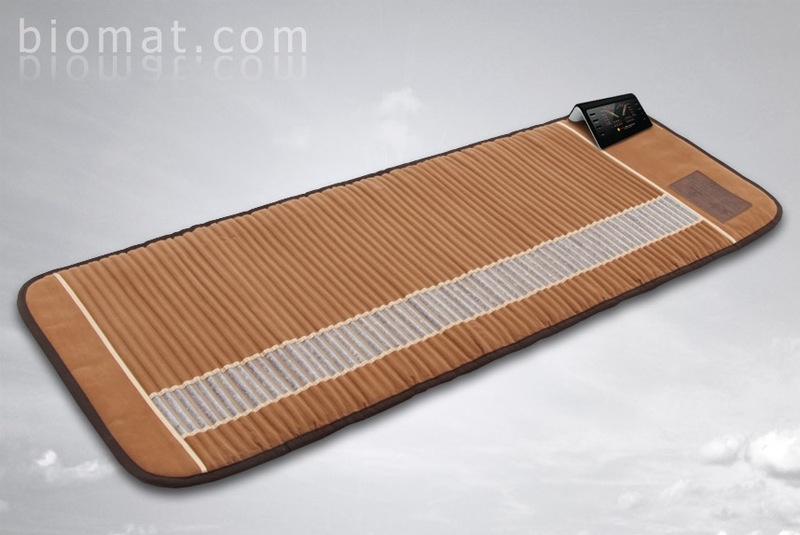 In addition, the BioMat comes with the uniquely designed washable cotton pad for a gentler and more comfortable far infrared treatment. The BioMat has undergone rigorous third-party testing, including registration and certification by the FDA and ISO, respectively. The efficacy of the device’s far infrared rays has been confirmed by the Korea Institute of Far Infrared Applied Estimation. The device comes with a 3 Year Limited Warranty / Lifetime Trade-In Option. The soothing powers of the Professional BioMat 7000 MX have been gaining converts all over the world. 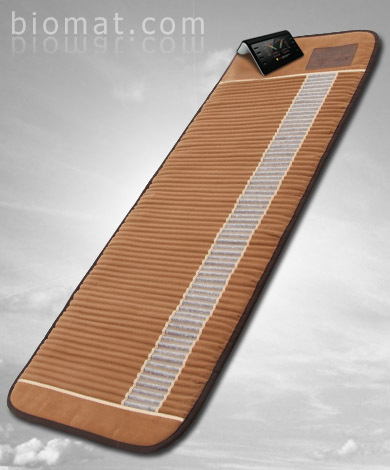 The BioMat’s unique design, which allows users to benefit from deep-penetrating infrared rays and an influx of negative ions, stimulates the body to soothe and relieve. Purchase your own Professional BioMat 7000MX for $1,695.00 or $1595 if you are a health professional, veteran or first responder qualifying for the $100 discount. You can relax in a deep-penetrating, healing treatment whenever you need it. Make a wise investment in your longevity and quality of life. The BioMat Professional comes with a full-length 27.56” x 74” pad, allowing for full-length body contact and optimal results, a state of the art temperature control system, and our unique designed cotton pad. Order your BioMat now. As a US FDA 510k Class II Approved medical device for pain management and muscle relaxation, the purchase of your BioMat Professional may be covered by your insurance company or health benefits provider. Currently, the main types of insurance claims being paid are Personal Injury Protection, Workers’ Compensation, and Flex Spending or Health Savings Accounts. Your BioMat Professional comes with a 3 Year Limited Warranty / Lifetime Trade-In Option. Make a commitment to your long-term health and enjoy the benefits of far infrared and negative ion treatments on a daily basis. D. RossI had lower back pain for twenty years which limited my movement and therefore my activities. I also have arthritis in my knees. I bought a BioMat and after sleeping on it at night for a couple of weeks I was pain free. I found I was doing things with ease that usually left me in pain and after a month I had much more freedom of movement. I also find that I am sleeping at a more restful and deeper level. I wish I had known about the BioMat years ago. I just love it. Tracey K.I first tried the BioMat when having a Shiatsu massage and I was hooked. The BioMat is fantastic it warms, relaxes, & is soothing for your body. I use my BioMat while watching TV, reading or before bed and I feel calmer, more relaxed and can drift off into a restful sleep. I love my BioMat this is one of the best purchases I have ever made! Dr. Emilie Salomons, Dr.TCM, R.AcThe biomat has been an incredible adjunction to my practice as an Acupuncturist and Chinese Medicine Practitioner. I use the mat with at least 75% of my patients, ... I find the biomat amplifies the success and efficacy of my treatments while also allowing for a warm and comfortable treatment experience. I can’t imagine my practice without it.